Sto. Tomas de Villanueva Parochial School celebrated its 52nd Founding Anniversary with a blast. The school held various activities on September 20th and September 21st. The activities were done not only to celebrate the feast day but also to further strengthen the school spirit and unity among students. The 52nd Foundation Anniversary of Sto. Tomas de Villanueva Parochial School, started off with a mass to bless and fully-unite the students for the upcoming events. The students returned to the school after the mass. They registered for the raffle in the Bingo Social and readied themselves for the parlor games. The elementary pupils joined the parlor games with the help of the SSG officers. The first game was “Planting Straw" played by pupils from Preschool and Grade 1. The next game was “Paper Knee” and the players were from Grade 2. The game played by the Grade 3 pupils was “Ping Pong Blow”. The Grade 4 pupils played “Balloon Pillar”. It was followed by the Grade 5 pupils with the game “Drink and Flip It”. The last game was played by the Grade 6 students wherein they flipped bottle caps. The children had a great time participating and playing the games with the SSG officers, who did a great job in organizing this activity. The game also served as bonding time with their classmates and parents. By 1:00 PM, the Bingo began. The game followed the patterns S, T, V, P, and S representing the name of the school. Each letter had the reward of 1,000 pesos as well as the game “Last Man Standing”. Moreover, 2,000 pesos was awarded to the winner of the “Blackout game”. With games of more than one winner, the winners divided the cash prize. The ballers for the Bingo game were Sir Joseph “Otep” Cruz, Sir RJ Villaseñor, Ma'am Elfreen Salinas, Ma'am Rechelle Carolino, Ma'am Ethel Cruz, Ma'am Joanne Binwag and Sir Carlo Mercado. After finishing all the letters, the game of Last Man Standing started. The rule is once a number from your card gets called, you are no longer in the game. The final game was “Blackout”. In this game, the first person to get all the numbers on their card called wins. The students, teachers, and parents enjoyed the said events. The novena and the mass held at 5:00 pm sponsored by the school marked the end of the first day of the celebration. The continuation of the celebration started with the Parade of Saints. Every section had one representative dressed in the section's patron saint. The festive vibe can already be felt during the parade as some students cheered with their respective festival. After the parade, the students prepared for the field demo presentation of the various festival dances in our country. The event started at 9:00 AM with the Nursery and Kinder presenting Pahiyas Festival. Next were the pupils from Grades 1 and 2 showing the festival in Baguio “Panagbenga”. The Grades 3 and Grade 4 pupils presented our very own festival “Pakalog”. 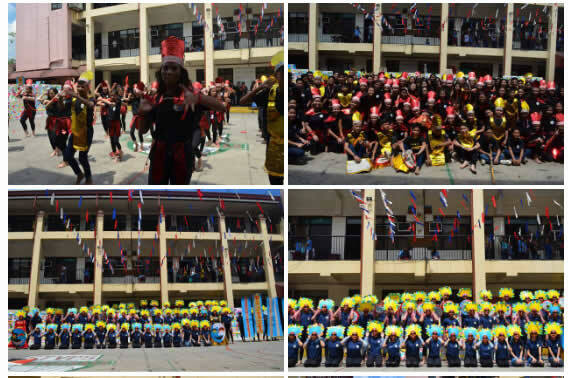 The Grade 5 and Grade 6 pupils came next with Sinulog Festival from Cebu, followed by the lively presentation of the Grade 7 students from Ilo-ilo “Ati-atihan”. Maskara Festival came next which was presented by the Grade 8 students. Their performance was lively, colorful, and eye-catching. Second to the last, were the Grade 9 students with Kadayawan Festival representing the culture of Davao. The final performance was from the Grade 10 students presenting Pintados Festival. Everyone gave their all to their performance and went really smoothly. The students showed their skills and creativity from the parade down to the actual performance with their colorful props and costumes. The atmosphere was amazing and all the students have done so much to present their assigned festival and to showcase their beautiful culture. This event had taught students to work together towards their goal. At 4:00 PM, the disco party entitled “WANDER” started along with “STVIANS GOT TALENT” that gave students the opportunity to showcase their talents. The disco also gave the students time to unwind after their long preparations for the events. To sum it up, the celebration of the foundation day was indeed a great success.